Having laid out the origins of the drama as image according to the memory theory of Cicero and the Rhetoric ad Herennium—taken in the context of Aquinas’ notion of the importance of images, or phantasmata to cognition—we have now begun to look at the actual phenomenology of performance against this matrix of memory. 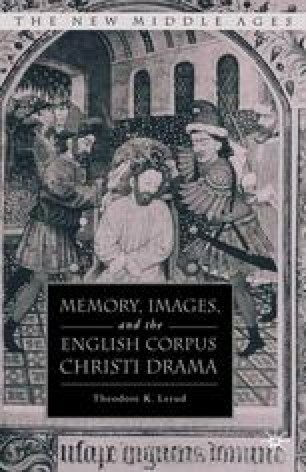 In the production of the English Corpus Christi plays, the frames of manuscript images—essential to their meaning by all accounts—become the doors, gates, and archways of the late medieval town, played out against a politics of space aptly described by Greimas, Ashley and Sheingorn, and others. As we have seen, much evidence has been adduced demonstrating the importance of playing places at York and Chester, but without adequate theorizing of the implications for dramatic production of the cognitive matrix of memory.